[UPDATED] Several profound market forces are preparing the ascendancy of Knowledge Economy products, which result from collaboration among designers, artists, engineers, customers and firms. This represents one of the Knowledge Economy’s most exciting-yet-disruptive elements: “products” will cease to be dominated by monolithic factories that mass produce virtually all items that people use and consume. Moreover, people have an inherent joy when they can make things for themselves, their friends and their families—and a dramatic new wave of creativity and innovation is imminent. To help you wrap your mind around Knowledge Economy products, this post will recall what happened to mass media and entertainment industries. Knowledge Economy products are conceived, designed, prototyped and fabricated in the Social Channel. Best practices in open source, Agile development, design and Web development will unleash continuous innovation at a scale and pace we’ve never seen before. Knowledge and innovation will be free in the Knowledge Economy because all supporting processes will become an order of magnitude faster and cheaper. Firms and brands that do not recognize and respond quickly enough will become irrelevant. Most brands can create a renaissance in relevance and value by adopting elements of the CommCo and ProAm social business models. Brands like P&G, Domino’s, Betabrand and Threadless are suggesting how it’s done. Read on to see how Knowledge Economy products will affect brands, manufacturers and service firms—and give leaders a once-in-several-lifetimes opportunity to recreate their firms and brands. To appreciate the scale and depth of change that awaits people and firms in the medium to long term, let’s do a thought experiment, in two steps. Now reflect on the disruption of the mass media you have witnessed or heard about. Depending on your age, it may be easy or difficult to remember mass markets in which producers produced and consumers consumed. The Internet, personal computers and cable didn’t exist, and there were few TV channels. You watched movies at the drive-in or the theater. You listened to music on the radio or vinyl, which gradually gained 8-track, cassette and reel-to-reel siblings. You got “the news” through TV or one or two town or national newspapers. Then, the tools of the Knowledge Economy’s means of production emerged serially. So-called “personal” computers began slowly, with games and “office productivity” programs, but their capabilities grew steadily, so amateur users, although lacking the “professional training and experience” of media companies, could manipulate and create photos, films, audio, and all kinds of media “content” for fun. Then the Internet became the digital infrastructure for learning and sharing. Social networks were a tipping point because they made it much easier and more rewarding to share, so far more people did. The result is, in 2013, mass media has been disrupted forever; it no longer has a monopoly on our attention; it has to share attention with other people’s news, music, films and stories. Individuals regularly “scoop” news that used to be the sole purview of “the media.” The media ‘industry” is much more complex. The line between “producer” and “consumer” has blurred. Countless “news” and “publications” titles have disappeared, and there seems to be no end in sight. Mass-produced products in most categories stand on the threshold of being challenged the way the mass media has been. With few exceptions, people prefer physical things that are made for them. Even more exciting: you can use these market forces to strengthen your firm and career. The Knowledge Economy’s digital means of production is coming to products. This lowers the cost of participation and the amount of capital required to design, prototype and distribute products. With media, we have seen that amateurs create and support things they love, so they do it for free. In addition, people can get involved based on their interests and skills: create (musician, videographer, writer), promote (share with friends on Facebook, blog reviews), or curate (create playlists on iTunes that other people can buy). They collaborate with others of all levels of skill. As detailed below, as people get involved with designing and fabricating physical products, it will transform our lives and economy profoundly—because “things” are a much larger portion of our economy than media. Individual people will create, organize and promote most categories of “products” that are produced by major brands today. This movement will gut entire industries if their players don’t learn how to harmonize with it. In October in the U.S., Kraft mayonnaise will not be able to compete with “Daisy’s Halloween Deviled Egg Mayonnaise” that was created, tested and promoted by a veterinarian and her friends and has national distribution. The same will occur in clothing, furniture, automobiles, lighting, appliances, and most “products.” Brands from major products will coexist with individuals’. Even more powerful, Knowledge Economy products are personalized to an unprecedented degree, so they will significantly change “consumer” expectations of major brands. To illustrate how the digitization of products is happening, here are some key tools of the new means of production. Open source collaboration—IBM is one of the largest and most influential hardware and software companies in the world. Its Ph.Ds and engineers have built some of the most complex software and hardware in existence. Yet it has become a major proponent of open source software, collaborating with engineers around the world to design many types of software. Open source means that people share work and ownership of what they are making, according to open rules. People usually “work” for free, for fun or to build their reputations. For many products, it is very difficult to “compete” against highly skilled people who work for free. Open source began in manufacturing and software and has extended into consumer products. A close cousin to open source is Agile development practices, which first coalesced around software, but Agile is currently being adapted to general business. In most cases, Agile enables people to far exceed the productivity of the long-cycle, rigid development practices in place in most firms today. Networked design software—Digital templates and platforms dramatically lower the cost of entry for amateurs to get involved because they enable people to build off each other’s designs and experiences in an easy-to-use way. You have probably used “templates” in word processing, spreadsheet or presentation programs. They encapsulate a basic level of structure and features that you can use as-is or modify. Platforms are core systems that are designed to provide key functionality or services and enable users to extend them. Facebook is a platform to which millions of developers have added “apps.” The same for Twitter and WordPress. Note that today, templates and platforms are usually Web-based, which minimizes compatibility problems. Now, imagine templates (examples below) for producing your own sweaters, coats, mustard, jam, pickles, desks, bicycles, light fixtures, and almost all the products you see around you. I’ll hazard that you are thinking, “That’s ridiculous, I’d never have time to make my own coffee table.” If so, you would be right: not everyone will make his/her own; however, I’ll wager that you have friends, family, neighbors or colleagues who will be involved in making products the same way people blog or upload videos to YouTube today. Moreover, you may buy your friend’s because s/he can make things for you—or just because you know the maker. Just the same way as people buy each other’s playlists on iTunes or use each other’s investment portfolios on Covestor. 3D printing—3D or “additive” manufacturing fabricates physical objects from digital models. Up to now, most manufacturing was “subtractive” because small parts were cut out of large pieces of materials before being fastened together. 3D “printers” use material (resins, composites, metals) to “build” entire objects, one layer at a time, very precisely. The point is, people can now use software to model objects very precisely. Other software simulates the usage of the modeled object, so the creator can iterate the design before committing to fabricating it. To take a simple example, a potter makes a coffee mug by preparing a pile of clay, spinning and shaping it on his wheel and firing/painting/glazing it. Most of the clay in the pile goes back into the bucket. The potter might have to make several mugs to “get it right,” which would require expensive resources and time. A 3D printer would take the design and build the mug using exactly the right amount of material to make the mug. Many of the products we use are designed for manufacture first, and the user second. The parts have to be practical to fit together during the manufacturing process. 3D printers change the rules completely—and make it possible for people to make things much more easily than ever before. Another simple example. When I was first an editor in the 1970s and 1980s, teams used “light tables” to line up stories on the page. When they were aligned, we physically pasted them on the main page before reproducing the whole thing. That is laughable today, when digital tools control the whole process. Of course the “cut” and “paste” commands that are still used in software today originated in the pre-digital paper process. Knowledge Economy factories—These fabrication shops (hackerspaces and factories-for-hire) are full of 3D printing, tooling equipment and people to help members, and they are springing up around the world. This enables people to design objects to have them fabricated nearby, without having to buy the production equipment. There are many models and experimentation, but most currently enable anyone to become a member, undertake minimal training and use the facility. For examples, see below. People will create businesses that create products for very specific uses, that are very personalized, but they will leverage economies of scale afforded by digital design and fabrication. Even more important, as more people become skilled at using digital means of production to produce products, they will make products more personal and meaningful. Your wife (brother, daughter), armed with templates and a hackerspace membership, makes you a beautiful and stylish computer desk for Christmas, but only she knows that your lower right leg is one inch longer than your left, so she makes the desk accommodate that. It’s a simple tweak of the digital design, and the 3D printer takes it in stride with aplomb. We will all have clothing that fits. Some people would love toilet paper emblazoned with the name of their favorite NFL team’s arch rival. “Customers,” once they realize that they can have “products” how they want, will let their creativity roam, and this cycle will feed on itself. You like pickle relish with dill and red jalapeños instead of sweet gherkins? You’ve got it, in the Social Channel: get a bunch of people together and commission it. You can do it online. The threat for brands is, impersonal products will commoditize far more than today. Astute products, brands and firms will learn the lesson that the relatively-few-remaining mass media firms are barely learning. It is a hard lesson but easy to see in retrospect. The key to success is interoperating with empowered people. Smart mass media firms are learning to let amateurs participate in their operations. In fact, they redefine themselves as platforms. Large brands retain prestige, and, if they manage themselves properly, their reputations and relevance increase over time. So people like to increase their own prestige by extending major brands’ offerings. But major brands need to design roles for amateurs to get involved in meaningful yet appropriate ways. This means sharing control with people, a revolutionary idea that’s mainstream in the Knowledge Economy, whose watchword is collaboration. CSRA calls this social business model ProAm, Professional-Amateur. The key to making it work is recognizing the unique value add of each role and designing participation that’s appropriate and meaningful for all parties. The lowest bar in media is commenting on stories/posts. More titles are enlisting “citizen journalists,” who work hard for free. Like open source contributors, they are usually unpaid in money; they work for fun or to build their reputations. Imagine major retailers offering shelf space to independent clothing designers. Samuel Adams already produces and distributes three customer-produced beers each year. Chain restaurants could feature customer recipes on rotating schedules. They will discover that customer-produced “products” can dramatically increase relevance, loyalty and profit. Those brands that “defend their turf” and scoff at “inferior” customer products will not live to regret it because customers’ expectations will shift, slowly at first, then suddenly. People will come to expect personalization, and brands, no matter how hard they try, will never be able to “compete” with millions of people who work for free. No matter the firm, there are always more smart people outside the firm than inside, and now they are empowered with digital tools. Smart brands will harmonize with this trend and profit all the more. Not all product categories will be affected at the same degree and at the same time, but the trend is clear. 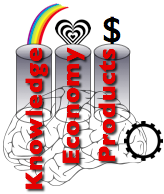 Here are elements of Knowledge Economy products that are currently underway. Another critical aspect of Knowledge Economy products is that it is empowering for people to use many of the technologies and processes that formerly enabled huge enterprises to dominate their lives. Made in China brings this point home. It can contribute to a movement away from the “passive consumer” to self-sufficiency and creativity. For example, Africa will likewise become an innovation powerhouse, using the Knowledge Economy’s means of production. Many of China’s hackerspace founders consciously nurture a political side to their cooperatives; they see it as part of their mission to rebalance China’s society and economy. “Developing” economies have people who are highly motivated, so they will often take risks and move before established players in current-state dominant economies. If the latter are sleeping at the wheel, they will often be severely disrupted. I have long predicted that “developing” countries would become innovation powerhouses in the medium- to long-term. Specifically, China and India have huge populations of highly motivated people who, once they get the tools and processes in their hands, will innovate incredibly. However, a tempering constraint looms as well: as Social Channel Three asserts, more personalized products will often give the edge to firms that serve their home markets—because they can appreciate and design in cultural elements of their products. Products that compete on product features are easier to copy and disrupt, where highly personalized products require more insight into people and culture. However, any firm anywhere can use the Social Channel to develop relevance to any culture or set of customers. Relevance based on listening and responding to people’s needs will trump all, no matter who offers it. AtFAB is aDesign library that enables people to customize its templates to design furniture easily—and fabricate at hackerspaces or DIY storefonts. 100kGarages is a community that connects people with digital designs to fabbers who turn designs into physical objects. SketchChair is free, open-source software that allows anyone to design & build their own digitally fabricated furniture. Inventables, founded in 2002 to enable Fortune 500 innovation, changed its business model and now serves makers, billing itself as the “Hardware store for designers.” Its excellent blog highlights maker events, ideas and products. This is a brief sampling.. see the entire list, which is constantly updated here. Maker-produced cars: Local Motors is a firm that produces vehicles; valuable because it shows that “collaborative manufacturing” can take on complex products as well as simpler ones. In addition, Makers can be designers/plants for hire as well as producers. The CommCo social business model: Threadless and Betabrand show the social channel’s power of “customer” engagement to the point that customers run innovation—for free. CommCo is CSRA’s name for the “Community Company” social business model. It’s a hyper-efficient way to share product innovation with your product’s/service’s users. I predict it will come to dominate most “consumer product” categories, especially when brands build the hyper-configurable plants they’ll need to survive. See my take on this vision for food products (“Analysis and Conclusions”). I hope you can see that an unprecedented disruptive period is afoot. I intend this statement without hyperbole. I urge you to think about it. People will become empowered to redefine what a “product” is. Today, the “product” is the faceless output of a machine somewhere. The firm pays marketers and advertisers to “make it relevant” or “give it personality,” but today’s products are abjectly impersonal compared to tomorrow’s. In 20 years at most, people will regard impersonal products with disbelief. I have had the good fortune to work with many of the methodologies above—in the enterprise software industry. I have seen how Agile, open source and pervasive reuse have transformed entire organizations. It is mind-blowing for me to realize that this transformation is unfolding to redefine what we think of as products. These methodologies are proven, so their adoption within the context of making products will be easier in some ways than making software; in addition, Web-based software collaboration platforms and tools are far easier to use. All people are doing is applying best practices to a new area: conceiving, designing, prototyping and scaling products. New technologies like 3D printing are being used in such mission-critical applications as airplane wings. I have been thinking about this a long time. 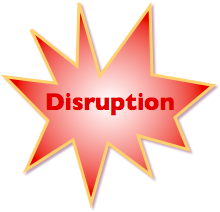 Check out my 2006 prognostications about the disruption of products, firms and brands. References—I have numerous references that can help you dive deep. See Maker, Hackerspace and Mass Customization. Acknowledgement—I would like to thank OpenClipArt.org for some of the images used here. They make the world a better place!